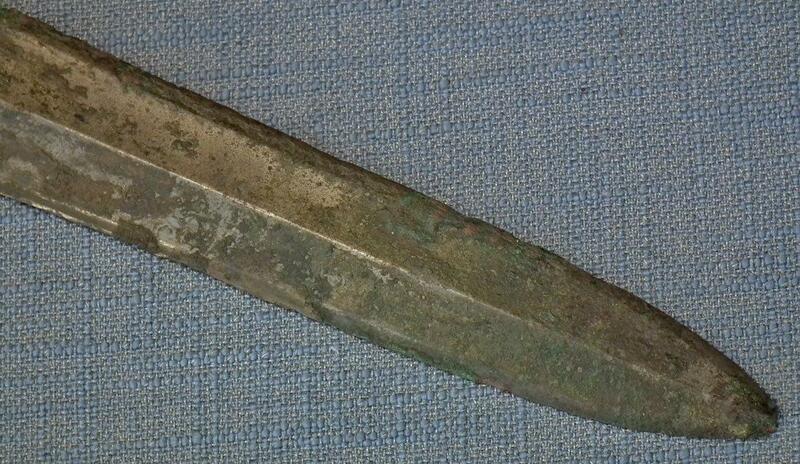 A very rare bimetallic bronze sword of extremely high quality with a long tapering double edged blade with a median ridge, beveled edges, rhombus thin cross-guard, and a slightly tapered tubular hilt. 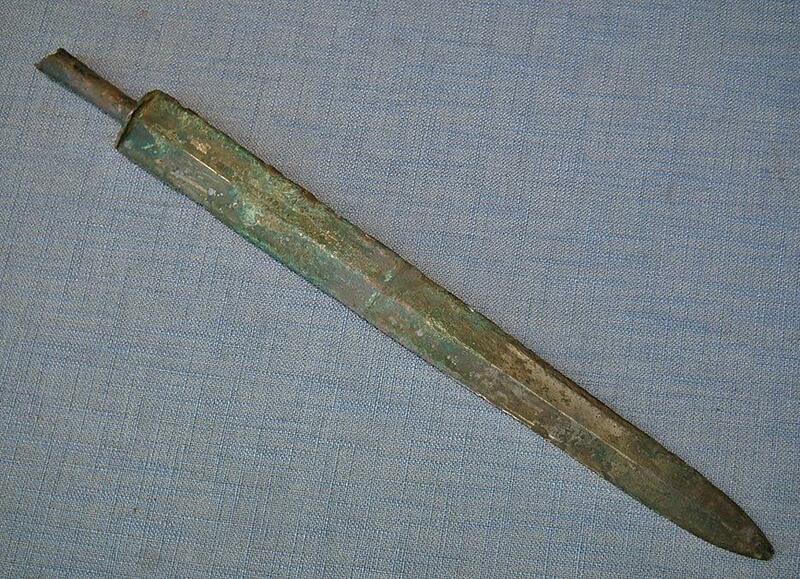 CONDITION: The bronze has a silver-grey patina and extensive malachite green encrustation. The grip is cracked and repaired. 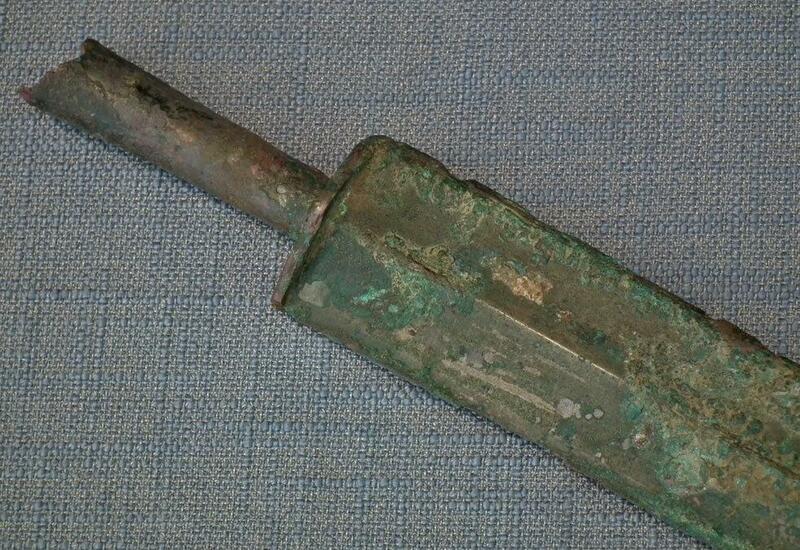 The blade was broken and repaired by inserted metal pins and secured by epoxy for the metal. There is no pommel. Please notice that the pictures in the listing are a part of the description of the condition of the object. 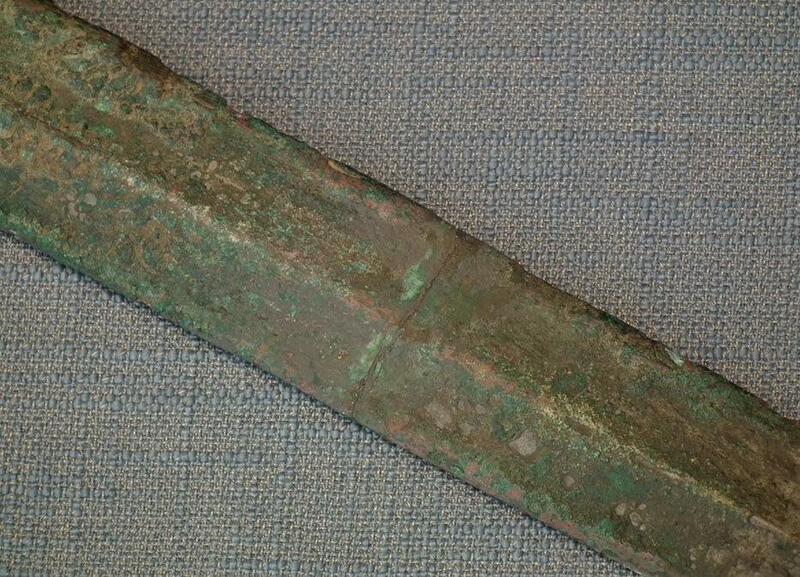 These swords were cast in several stages and this one has a softer core of higher copper content for increased tensile strength to be able to flex to prevent breakage, but the edges are with a higher tin content to hold harder, sharper edges to retain cutting power. 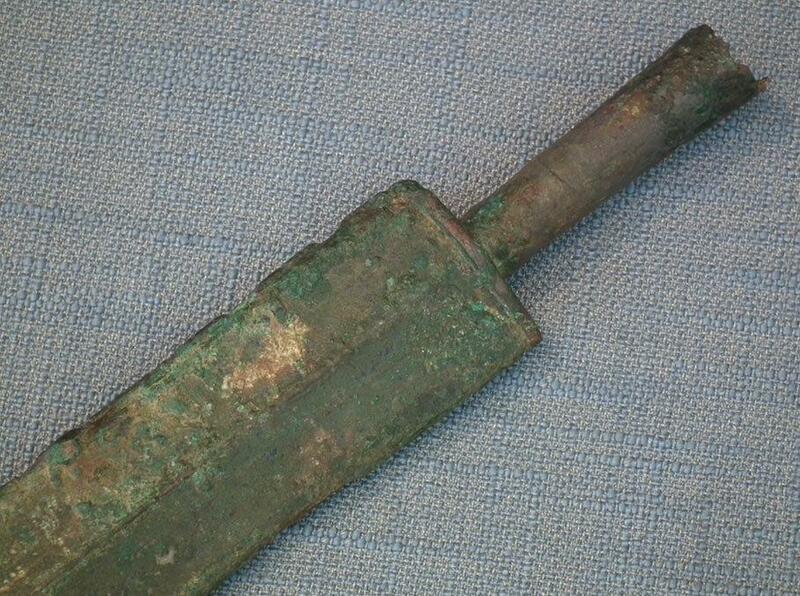 Swords like this were generally crafted for very important or high-ranking individuals. PROVENANCE: From an old Canadian collection formed in the 1980s. 1. The Path to Victory: Exhibition of the Art of War and Fine Antiques of the Ancient Chinese Military, by ZHONG GUO REN MIN GE MING JUN SHI BO WU GUAN BEN SHE. 2. Soldiers of the Dragon: Chinese Armies 1500 B.C. - A.D. 1840, by C.J. Peers. 3. Ancient Chinese Armies, 1500 B.C. - 200 B.C., by C.J. Peers. The buyer will be provided with a copy of the pages from the mentioned references, together with a certificate of authenticity. 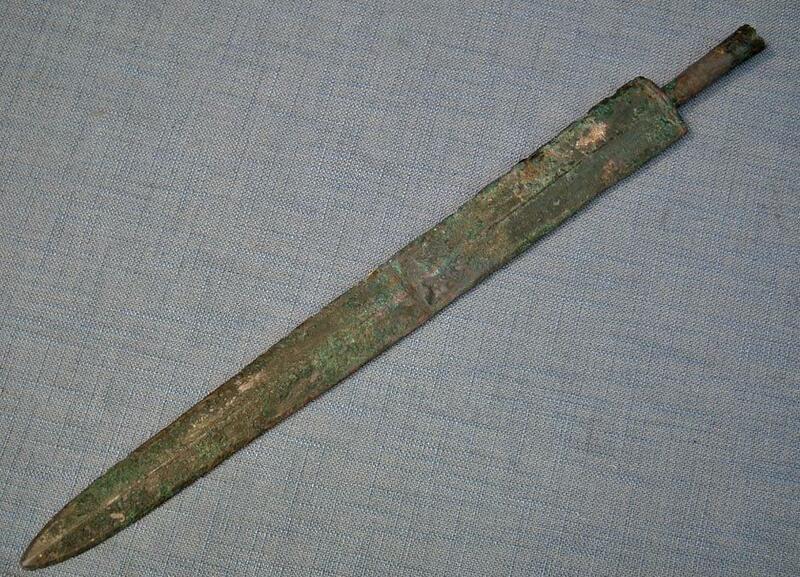 Due to the fact that the market is flooded with reproductions of ancient Chinese Bronze swords, which for inexperienced collectors look the same as the authentic artifacts, we would like to inform our clients that this is a 100% authentic ancient Chinese sword from the Warring States Period (475–221 B.C.) and is accompanied by a Certificate of Authenticity.